Qiu Ju (Li Gong) is on a mission. Her husband Qinglai (Liu Peiqi) was kicked in the groin by the village chief Wang (Lei Kesheng). Now she demands an apology, but Wang doesn’t want to lose face and stubbornly refuses… he also believes he was in the right, having been insulted by Qinglai. 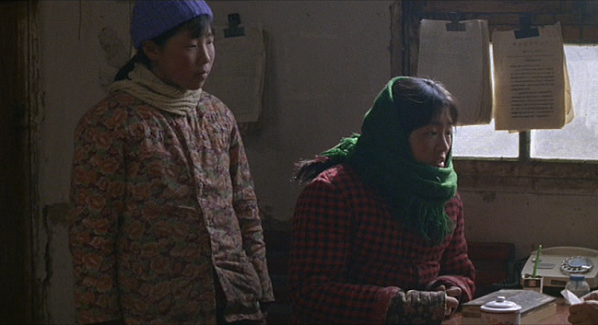 A very pregnant Qiu Ju, with her loyal sister Meizi (Yang Liuchun) in tow, goes to the village authorities and speaks to Officer Li (Ge Zhijun). Unsatisfied with the decision, she pursues the matter with the district, then the city, then the courts, then an appellate court. She won’t back down, and neither will Wang. How far is too far in the name of justice? This is a film from my top 100, so obviously I have a great fondness for it. I love a movie that explores the rich complexities of very small drama, where the situation doesn’t overwhelm the character studies to be made. And drama doesn’t get much smaller than a kick in the balls. Everything here is understated, from Li’s stellar performance, to the commentary on the ineffectiveness of the Chinese government, to the beautiful cinematography with its soft shafts of light and muted but lovely colors. There are no heartstring-pulling moments, just people acting like people do, for better and for worse. Qiu Ju’s tenacity is admirable, but misdirected. Two worn-out maxims come to mind: “You have to choose your battles” and “Be careful what you wish for.” Does Qinglai deserve an apology? Yes, probably… then again, so does Wang. Everyone else is willing to just let it go, but Qiu Ju’s unbending need for what she considers justice is her undoing. Too late she realizes not that she was wrong, but that some things are better left alone. While Li is excellent and nuanced (her balance of suspicion and trust is endearing for reasons I can’t quite explain), I can’t neglect any of the other actors. There isn’t a performance here I don’t love. Each character has qualities that makes them come alive on the screen. Qinglai’s patience which eventually starts to fray. Meizi’s quiet, uncomplaining devotion. Li’s good-natured attempts to smooth things over. Wang’s two-faced arrogance. Even the ancillary characters seem so real that you feel like you’ve known them all your life… Qinglai’s father, Yan the district official, the manager of the cheap hotel, the young couple applying for a marriage license. This entry was posted on April 27, 2013 at 6:40 pm	and is filed under Movie Reviews. You can follow any responses to this entry through the RSS 2.0 feed. You can leave a response, or trackback from your own site. I adore this movie – and haven’t watched it in forever. Will have to put it back in my queue. Gong Li is fantastic. She is indeed! So glad you’re a fan of it!